Request or research military service records, replace lost medals and awards. This site is provided for those seeking information regarding military personnel, health and medical records stored at NPRC (MPR). AcademyWomen is a nonprofit organization which offers programs to support and enable women from the nation's officer development programs to reach their full potential as leaders. AcademyWomen is aligned for the greater good of the military. It is our belief that every woman who chooses to serve her country should be fully prepared to do so. AcademyWomen provides supplemental sources of education, leadership development opportunities, and resources to achieve better personal and professional balance for military women and women veterans. We are a global leadership organization of current and former women military officers, cadets, midshipmen, candidates and all individuals committed to the success of AcademyWomen's mission. Our members are the world's outstanding leaders, including: military officers, astronauts, pilots, combat leaders, ship commanding officers, business executives, diplomats, civic leaders, entrepreneurs and homemakers. Our members are the pioneers who bravely sought military training and now represent a new and outstanding paradigm of leadership. Through a group of like-minded women and men, we will help to fill the existing gap of support by leveraging a global network; inspiring our members ideas and action; and equipping our members for leadership impact. Connecting US veterans to business leaders through our two free programs: an online network offering business advice, and a nationwide mentoring program. The AMVETS Career Centers powered by Call of Duty Endowment provides free of charge career training and employment assistance for veterans, active duty service members, national guard and reserve plus spouses. The Army Career and Alumni Program (ACAP) delivering a world-class transition program for America’s Army that ensures all eligible transitioners have the knowledge, skills and self-confidence necessary to be competitive and successful in the global workforce. ACAP helps transitioners to make informed career decisions through benefits counseling and employment assistance. ACAP is responsible for delivering both transition assistance and employment assistance services. While the ACAP Center traditionally has been the principal service provider for these services, now transitioners have the option to use the ACAP On-Line website to receive services from any location with Internet capability 24/7. The Army Soldier for Life program supports successful reintegration of our soldiers, veterans and their families in order to keep them Army Strong and instill their values, ethos, and leadership within the communities. The Australian Defence Force looks to overseas candidates to fill gaps in our Services, which can't currently be satisfied by standard recruitment. We recognise that these candidates can bring skills and attributes to the Navy, Army and Air Force that will strengthen their overall operation and success rate. We are looking for serving or ex-serving foreign military personnel, who can directly transfer their job and life skills to whichever Service they join, with limited training and preparation. We provide a personalized Career Fitness and Mentoring program allowing participants a professional assessment, review of career options, job search and networking. We recently expanded this successful program to allow participants to work with a career-appropriate mentor. The Call of Duty Endowment is a non-profit public benefit corporation which helps soldiers transition to civilian careers after their military service. The Call of Duty Endowment focuses its resources on assisting organizations that provide job placement and training to veterans, as well as engaging the media and public forums to raise awareness about the issue. Career One Stop is your pathway to career success. Tools to help job seekers, students, businesses, and career professionals. Sponsored by the U.S. Department of Labor. Veteran Specific Training and Job Placement Services. Charlotte Bridge Home helps Charlotte-area Veterans successfully transition home after military service by identifying their education, employment and healthcare needs and connecting them to available community, state and federal resources. VA will reimburse veterans for required CLEP test fees including registration fees, fees for specialized tests and administrative fees. Our goal is to provide opportunities for combat veterans who are ready for a rewarding, life-long career by giving them the necessary tools for success. Focusing on the four main areas of education, employment, affordable housing and wellness, we are able to provide our veterans and their families with 360 degrees of support and well-being. The need for this support grows each day as veterans continue to reach out to us. Together we can continue to ensure the men and women who have chosen valiantly defend the freedoms we enjoy will receive the support they need to achieve the civilian lifestyle they deserve. Competitive Edge Services Inc., better known as “Corporate Gray,” connects transitioning and former (separated/retired) military personnel with employers nationwide in print, in person, and online. Corporate Gray Online is a military-niche employment website connecting transitioning and former military with employers. Job seekers can post their resume, search and apply for jobs, learn about upcoming job fairs, and gain access to important reference links in their job search. Employers can post their jobs and use a customized search to find military-experienced job seekers whose skills and experience match their needs. The GI Bill is one of the most important ways our country says Thank You to veterans, but this crucial legislation is under threat. Some schools are putting profits ahead of veteran education. Help us crack down on these predatory schools. Don't let them target your benefits or your wallet. Get the facts and tell Congress to defend the new GI Bill. IAVA provides you an opportunity to share your story. Did you get scammed by a for-profit school? Be sure to check their resources, especially the Veteran's Student Loan Relief Fund. The Drive For Hope® program of Hope For The Warriors engages service members focusing on transition and invites them to racetracks across the country. Engrossing them in a unique social setting and experience while they reintegrate into civilian life and giving them the opportunity to contemplate their future career endeavors. Hope For The Warriors invites local service members and veterans to NASCAR races throughout the country through our Sports and Recreation and Transition Services programs. Service members have the opportunity to network with professionals within the NASCAR community in careers that complement the service members’ military occupational specialty and post-military career goals. Currently participants are chosen on a case by case basis for select races only. Easter Seals’ Veterans Employment Program provides veterans and wounded warriors with the resources and services to succeed in the 21st century workforce by maximizing their employment opportunities through education, job training, job placement and follow-up support. Through a partnership with the U.S. Department of Labor, Easter Seals eases the transition from active duty to successful employment in civilian life. Empower Employ is dedicated to enabling military veterans and their spouses to obtain meaningful and valuable employment. Empower Employ brings them together through our secure, web-based applicant tracking system (M-Power) & talent community to match job seekers have served our nation with the companies and corporations who have supported them. Employer Support of the Guard and Reserve (ESGR) is a Department of Defense (DoD) organization. ESGR was established in 1972 to promote cooperation and understanding between Reserve component members and their civilian employers and to assist in the resolution of conflicts arising from an employee's military commitment. The mission of the Farmer-Veteran Coalition (FVC) is to mobilize our food and farming community to create healthy and viable futures for America’s veterans by enlisting their help in building our green economy, rebuilding our rural communities, and securing a safe and healthy food supply for all. The coalition seeks to simultaneously assist the farming community by developing a new generation of farmers and to help our returning veterans find viable careers and means to heal on America’s farms. The one-stop resource for Federal veteran employment information. F7 Group is dedicated to securing and providing resources, training, support and mentoring to Female Veterans and Women in Military Service, both IN and BESIDE the uniform. F7 provides fundamental tools, systems and networks through retreats, boot camps and technology based platforms. We provide these services though sponsorships and donations made to the organization. Four Block provides student-veterans with professional development and connectsthem with internship opportunities at corporations. GallantFew, Inc. is a nationwide Veteran mentor network that helps our returning heroes transition successfully from military service to civilian life. GallantFew provides a social network, professional development, emotional support and physical assistance. Our founder, a veteran, has experienced unemployment. He has fought translating his military skills (Airborne Ranger, infantry company commander and Ranger battalion staff officer) into language appealing to civilian employers. He has experienced the incredible delays in the VA medical system - and he believes we can do better. This is the website for all educational benefits provided by the Department of Veterans Affairs. Did you know that you can use your Post-9/11 GI Bill for on-the-job training, apprenticeships, and non-college degree programs? IAVA's GI Bill Calculator is a one-stop shop featuring all the educational information, legislative updates and interactive tools that veterans need to decide what school is right for them and their families. Grace After Fire provides support for and helps women veterans of the United States military who are returning from active duty so that they can re-engage as mothers, wives and daughters in civilian life. Grow with Google is an initiative to create economic opportunities for all Americans and help them access the best of Google’s training and tools to grow their skills, careers, and businesses. For military service personnel, transitioning to civilian life can be very difficult. Many people begin their job searches on Google, so we started with Search to help those who have served and their families. You can search “jobs for veterans” on Google and enter your Military Occupational Specialty code (MOS, AFSC, NEC) to see relevant civilian jobs that require similar skills to those used in your military roles. Helmets to Hard Hats is the fastest way for Military, Reservists and Guardsmen to transition from active duty to a career in the construction industry. The H.E.R.O. Child-Rescue Corps is an unprecedented new force in the global battle against child exploitation and abuse. Learn more on these pages about how some of America's most tested and proven warriors are mobilizing to rescue children in danger. Then join us. There are many ways you and your company or organization can support the H.E.R.O. Corps mission. The Armed Forces Support Foundation was established in 2006 with a mission to plan, promote, and execute programs to assist members of the United States Armed Forces transitioning back into civilian life. Today our flagship program Hire A Hero is the premier online job board and community of choice for those who have served our country. Hire A Hero has helped thousands of veterans and their spouses connect to employers who value their service, work ethic and loyalty to our country. Hire America’s Heroes seeks to promote best practices and success strategies by which America’s military family members are welcomed into the corporate workforce. Veterans of all eras, transitioning service members, spouses, wounded warrior care-givers, members of Blue Star families and Gold Star families are all welcomed. We work to influence the ecosystem for increased employment of military service members as a category. Our services are directed toward educating and informing stakeholders in order to raise their understanding of relevant issues, connecting the players who can influence the issues, and promoting action that will result in family-wage jobs for members of the military family. Hire America’s Heroes is a non-profit corporation. The organization seeks to connect America’s major corporations with the rich skills and abilities of military service members and their families for the purpose of employment in the corporate workforce. In March of 2011, the U.S. Chamber of Commerce launched Hiring Our Heroes, a nationwide initiative to help veterans and military spouses find meaningful employment. Working with our network of 1600 state and local chambers and other strategic partners from the public, private, and non-profit sectors, our goal was to create a movement across America in hundreds of local communities where veterans and military families return every day. There are four pillars of the Chamber’s Hiring our Heroes program. While the main focus of effort is on conducting 100 hiring fairs for veterans and military spouses in local communities across the country, we have also created strategic partnerships to deal with specific populations of veterans and their unique challenges in three other areas to include: a Wounded Warrior Transition Assistance Program, a Student Veterans Internship and Employment Program, and a Women Veterans and Military Spouses Employment Program. Our aggressive agenda focuses on one measure of success—jobs for the one million unemployed veterans in America. Home Base Iowa is here to help veterans find jobs, explore career paths, and make a smooth transition to civilian life in Iowa. In an ideal world, someone who has mastered the challenges of military life would find countless opportunities back home. Home Base Iowa has developed this site to provide countless resources on opportunities in Iowa. It’s an honor to assist you in any way. That’s why this site features job postings, links to job fairs, and up-to-date information about educational opportunities, National Guard recruiting, job training, and much more. Honoring Our Troops is a San Diego based 501(c)(3) dedicated to providing veteran transition assistance and free legal assistance. We address these unique needs of veterans through self-help legal clinics, veteran-oriented seminars, and mentorships, which in turn, empower the lives of veterans and their families. Inc. launched the Military Entrepreneur’s Program to educate, mentor, and inform service members and their families about entrepreneurship. The Institute for Veteran and Military Families (IVMF) is the first interdisciplinary national institute in higher education committed to supporting transitioning servicemembers, vets and their families. Are you a service member in transition? Are you concerned about your mental health treatment? Have you received new orders? Are you looking at an upcoming change in status, relocation or return to civilian life? If so, and if you are currently receiving mental health care, transferring to a new provider can be easy. Sign up for the inTransition Mental Health Coaching & Support Program. Coach you one-on-one as you go through your transition. Connect you with your new provider. Empower you with tools to continue making healthy life choices. All inTransition coaches are skilled counselors. They understand today’s military culture and issues. They understand and respect the importance of your privacy. They are with you every step of the way. The Institute for Veterans Education and Training (IVET) is a non-profit organization. Our goal is employment for veterans and their spouses to match or beat the national average within 5 years. The IVMF and its staff of more than 70 professionals deliver class-leading programs in career, vocational and entrepreneurship education and training, providing service members, veterans and their families with the skills needed to be successful in education, work and life. The IVMF also coordinates comprehensive collective impact strategies; and works with communities and nonprofits to enhance service delivery for veterans and their families. They provide specific programs for military spouse entrepreneurs occurring at different locations around the country throughout the year. RSVP early for programs- they are extremely popular and fill fast! JibberJobber is acclaimed job search software to help organize and manage a job search based on input professional coaches, counselors and networkers. Use JibberJobber for the duration of your career to help during job transitions and to deal with unemployment or underemployment. JibberJobber is extending a special offer to servicemen and women that are serving their country in Iraq, Afghanistan or other areas. This special offer allows them to have full premium access to the system and extra features during the entire time that they are overseas and for the 12 months following their return. Note that this offer is not extended to all active duty military - just those that are serving in war and coming home (or those that have recently come home). KanVet provides direct access to State of Kansas veteran-specific resources and benefits without having to navigate multiple state agency websites. Serving all veterans, transitioning service members and their families. Kitchen Tune-Up supports our troops! We are a veteran friendly franchise, which offers a 10% discount to honorably discharged veterans. If you’ve thought about owning your own business, consider this—our program provides the opportunity to purchase a home remodeling franchise for a realistic initial investment, with financing options available. Kitchen Tune-Up locations across the U.S. and Canada specialize in affordable kitchen and bath remodeling. We are known for our signature wood reconditioning "Tune-Up", cabinet refacing and redooring, custom cabinetry, and closet organization. We offer personalized service and incredible results. Confidential Government Solutions strives to help reduce the unemployment rate for veterans by providing military members, veterans, and their spouses who are entering or are on terminal leave, the education and information needed to experience a smoother and faster career transition. As a new non-profit, it is exciting to build this new program for our military service members and Veterans in transition. We are an IRS approved 501(C)(3), TEXAS nonprofit corporation and operate exclusively for educational, charitable, and patriotic purposes within the "meaning of the IRS Code of 1986, or the corresponding section of any future Federal tax code. We provide results oriented career development training, career coaching, mentoring, career assessments, and internship opportunities through our sponsors, that will expand their career transitioning experience during their first year of separation, at no-cost to the military member, veteran, or his/her spouse. We believe our Veteran-to-Civilian Assistant Program, better known as V-CAP, will provide them with the right steps and support needed to help reduce Veterans' unemployment rate by 50% in the San Antonio, Bexar County, Texas region. Little Caesars is looking for veterans with integrity and character who take initiative, utilize a teamwork management style and have a strong personal commitment to the business. A Little Caesars franchise can provide business owners with the opportunity to become leaders in the communities they serve, maximize their potential and realize a strong sense of accomplishment by achieving goals and growing their business. We offer a unique and personalized service networking your recruitment needs with integrity. Our mission is to bring job-seeking military veterans together with hiring companies to fill open positions worldwide. We are not merely a job board or a recruiting service: we are dedicated to providing both proactive assistance for veterans and their families with their transition back into the civilian workplace, and assistance for companies with open positions in fulfilling their recruitment needs. These are schools that serve. Hundreds of U.S. colleges responded to our survey on how they recruit and support military veterans. Features revolutionary personalized checklists to guide a member through transition even before they begin their separation process from the military. In 2004, Military.com joined forces with Monster Worldwide (NYSE: MWW) to accelerate our growth and change the playing field for career and educational opportunities for servicemembers, veterans and military spouses. Monster's vision is bringing people together to advance their lives, which is a great fit with Military.com's "members first" ethos and goal of connecting the military community to all the benefits of service. Welcome to MilitaryHire.com: Your military hiring network. This site has been developed and is maintained by a team of both military veterans and corporate hiring authorities. We have worked hard to create a network where former military personnel can seek careers and utilize their professional skills. Our mission is to "Serve Those Who Served" by connecting veterans of America's armed forces with employers who value their experience and skills. A forum for senior military leaders, their spouses, prospective employers and other experts who work with this unique community to address the challenges, opportunities and best practices inherent in military to civilian transition. MOAA is the professional association for military officers and their families at every stage of life and career. The Military OneSource Online Libraries have something for everyone. From children's audiobooks to career preparation exams, these free resources are available from the comfort of your home computer. Career Corps serves as a stepping stone for military spouse and veteran job seekers. The program provides current work experience, training to develop transitional skills, recent industry experience to fill gaps in their experience and grow professionally. With unemployment in the United States remaining at high levels, competition for available positions is fierce. Due to the high levels of unemployment the market is saturated with skilled workers for employers to choose from, each posting often has hundreds of applicants. Making it difficult for those within the military and veteran communities without direct or recent industry experience to find and secure employment. The Military Spouse Corporate Career Network (MSCCN) set the bar in the creation of Career Corps. Career Corps takes the typical volunteer program to the next level by providing current work experience, advanced skill training, professional development, networking, and mentorship while assisting each CC member with employment readiness and placement. MilitaryVetJobs.com respects the men and women of the military and the service they’ve provided to our country. MIlitaryVetJobs.com, a veteran owned organization, offers veteran job seekers a community of support and connections to employers seeking qualified, veteran candidates. MilitaryVetJobs.com is a vehicle in which employers demonstrate their commitment to our veterans as well as diversity and inclusion initiatives. Veterans are a unique subset of the workforce due to the distinctive experience only gained in the military. By posting positions on MilitaryVetJobs.com, employers are ensured access to the highest quality of veteran candidates. CEOs4Heroes (C4H) is a partnership program involving top named companies interested in hiring veterans. C4H provides a link between our partner companies and the veterans seeking employment for which they are qualified. The companies we work with provide a period of training to allow a smooth transition and the utmost of job satisfaction. Site has a Current Job Listing. IAVA’s NewGIBill.org provides veterans, service members and their families with information about their New GI Bill benefits, including a benefit calculator, updates and answers to frequently asked questions. NextOp, Inc. is a nonprofit organization connecting veterans to Energy, Construction and Healthcare sector companies looking for skilled and semi-skilled workers. Empowering veterans and military spouses with employment and education opportunities. Welcome to your tool for career exploration and job analysis! Boots to Business is a program offered by the Whitman School of Management at Syracuse University (SU) in cooperation with the U.S. Small Business Administration (SBA) and is operated by SU's Institute for Veterans and Military Families (IVMF). It is a three phase training program developed to introduce and train transitioning service members to business ownership. Boots to Business begins during the service members tranistion from the service (TAP or TAMP) and can continue if the service member decides to self select into phase II and III. The Operation Endure & Grow program is a new online training experience focused on the fundamentals of launching and/or growing a small business (founded at the Whitman School of Management in 2010) that is administered by the Institute for Veterans and Military Families at Syracuse University in cooperation with the U.S. Small Business Administration. The eight-week training program is open to National Guard and Reservists, as well as their family members. To develop a positive and proactive mindset of veterans and give them the confidence and tools they need to wear a new uniform. To leverage proven experience and success strategies and to provide veterans legitimate opportunities at the careers they deserve. To recruit the support of individuals, corporations and organizations, forming a vast network of resources available to our veterans. Our vocational rehabilitation program, Operation PAVE, provides one-on-one career counseling and assistance to veterans and their families. With offices in every VA spinal cord injury center, we reach out to all veterans seeking to transition to civilian employment, return to school, or begin a new career search. All services, from résumé assistance, interview preparation, vocational counseling, or employer networking are provided at no charge—and are available to dependents as well. Our Master’s-level certified rehabilitation counselors work with employers by screening job candidates, remaining available as post-placement resources, and helping access state and federal resources for workplace accommodations. Patriot Boot Camp (PBC) is a nonprofit on a mission to equip active duty military members, veterans, and their spouses with the education, resources, and community needed to be successful technology entrepreneurs. The objective of PBC is to provide service members, veterans, and spouses with access to mentors and training to help them innovate and build the next generation of high-growth, scaleable and impactful companies. Patriot Boot Camp leverages a nationwide network of business and startup community thought leaders to help entrepreneurs bridge the gap between military service and entrepreneurial life. Career Marketing Techniques will help you focus your career search by working through your past experiences and accomplishments to determine your skill sets and provide guidance in applying those skill sets to corporate America. We ensure that your military background is properly represented, highlighting specific areas of expertise; we translate ranks, titles, jargon, acronyms, and showcase your military career history to a corporate employer, so they understand who you are and the value you offer their firm or agency. Project: Return to Work Inc. (R2W) provides employment services to all active duty service members, veterans and their spouses at Military & Veterans Employment Expos (MVEE). R2W also provides vocational rehabilitation services to wounded warriors and disabled citizens. R2W clients receive support from caring professionals and volunteers through an innovative evaluation, training, and placement process. R2W incorporates advanced technologies, methodologies, and a highly accurate online evaluation process to assist clients with finding the jobs they enjoy doing most. RallyPoint uses patent-pending technology to revolutionize the way US military servicemembers connect, develop, and pursue fulfilling opportunities throughout their careers. Created by veterans at Harvard Business School, we seek to bring the private sector’s best practices to your benefit by modernizing the world’s largest and most complex hierarchical organizations. Recruit Veterans is a professional consulting, staffing and recruiting firm that provides outstanding veterans with outstanding skillsets to federal agencies, federal primes and commercial businesses throughout the United States. The Personal Branding Resume Engine will help you translate your military service record into a strong resume. The skills and experience you gained as a service member can make you a great employee. However, it’s crucial to help potential employers understand how. With input from Fortune 500 human resources (HR) consultants, the Resume Engine will help you get your job search off to a positive start. Have you recently returned from military service? Now is the time to take advantage of the benefits VA offers OEF/OIF Veterans. Save-A-Suit is a nonprofit organization that provides our former military and college graduates with professional business attire and the confidence needed to succeed. Gain valuable skills in Information Technology - To acknowledge the tremendous contributions of the US military, SAP has launched the Veterans to Work initiative to help US veterans acquire the skills and training they need to be successful in today’s IT workforce. This program is providing training scholarships and certification programs on SAP market leading solutions. A listing of scholarships and grants available. Find millions of dollars in scholarships and grants exclusively for the military community! Our 320+ chapters hold events and workshops locally across the U.S. and its territories, and match up entrepreneurs with local, volunteer mentors. SCORE is headquartered in Herndon, VA. The SCORE Foundation, in partnership with major corporations, is pleased to offer the new Veteran Fast Launch initiative. The new program will be a combined package of training scholarships, free software and services combined with SCORE's mentoring program in order to help accelerate the ability of veterans and their families to start and succeed as small business owners. The SEAL Future Fund’s (SFF) mission is to provide resources to equip active duty and veteran Navy SEALs for success in the civilian world. Servicemembers Opportunity Colleges (SOC) was created in 1972 to provide educational opportunities to servicemembers who, because they frequently moved from place to place, had trouble completing college degrees. SOC functions in cooperation with 15 higher education associations, the Department of Defense, and Active and Reserve Components of the Military Services to expand and improve voluntary postsecondary education opportunities for servicemembers worldwide. The mission of Service2School is to help every transitioning military veteran win admission to the very best undergraduate or graduate institution possible. This service is provided at no cost to the service member. Silent Professionals is a highly targeted job site to help combat arms veterans find work using the skills they gained during their service. A completely free service to veterans, we boast an incredible 84% job placement success rate for candidates that we recommend to employers. We help to provide veterans a seamless transition from battlefield skills to corporate security skills. Several states offer veterans education benefits and programs of their own, in addition, or as an alternative, to federal GI Bill benefits. In some states, tuition waivers, scholarships or grants are offered for those who do not qualify for federal help, or to fill in gaps where federal help leaves off. In other states, assistance is provided to augment the federal benefits. See a state-by-state listing of education benefits on our website. Our mission is to empower Veterans including wounded warriors, and their families, by helping them reintegrate into the workforce and community via counseling, coaching, guiding, job transition, and assistance in obtaining all Veterans Administration (VA) benefits to which they are entitled. Our mission is to provide military veterans with the resources, support, and advocacy needed to succeed in higher education and following graduation. Today's veterans face numerous obstacles in their path of attaining a college degree. These challenges range from a missing sense of camaraderie to feeling like an outsider amongst 18 year old traditional students to a lack of understanding by university faculty. When coupled with the visible and invisible wounds of war, a college degree can be an elusive goal for men and women returning from military service. Student Veterans of America (SVA) makes that goal a reality. SVA is a 501(c)(3) coalition of student veterans groups on college campuses across the globe. These member chapters are the "boots on the ground” that help veterans reintegrate into campus life and succeed academically. Each chapter must be an officially recognized student group by their university or college and provide a peer-to-peer network for veterans who are attending the school. Additionally, chapters often coordinate campus activities, provide pre-professional networking, and generally provide a touchstone for student veterans in higher education. At Suiting Warriors, our mission is to support and empower veterans in their transition to the civilian workforce by providing them with professional business attire essential for competing in today’s job market. Our veterans of the armed forces leave the service with exceptional leadership skills, versatility, and creativity. Support Warrior Project helps vetrepreneurs kickstart start their own small businesses and positively impact their communities. 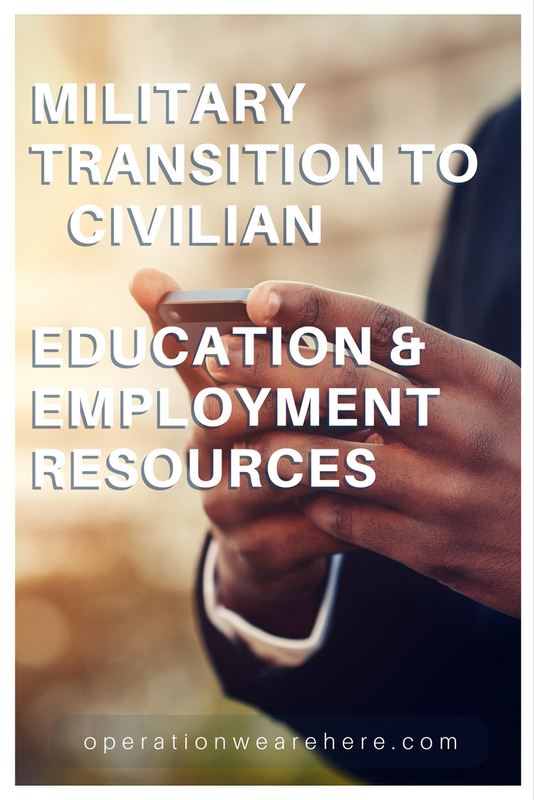 Transition Assistance Online, TAOnline.com, is the largest source of transition assistance information, jobs, and tools for today's separating military. On this career site for military veterans, service members can find the resources needed to transition from their much appreciated military service, to the perfect civilian career. Try our Job Search, Vet Rep and TAP Office locator tools. Team Rubicon unites the skills and experiences of military veterans with medical professionals to rapidly deploy emergency response teams into crisis situations. A new paradigm in disaster response that recognizes and harnesses the skills of military veterans; offering them a chance to continue their service by helping and empowering those afflicted by disasters, and also themselves. In 2015, we set out to change the way that high-tech executives perceive the skill sets of military servicemembers. Today, our educational programs allow transitioning veterans around the world to transform their careers. And we're just getting started. FREE Memberships and Training for Veterans - TechShop is proud to partner with the VA & GE to offer veterans of all eras a limited number of FREE 1-year memberships and $350 worth of training, good at all TechShop locations across the U.S. Participating veterans will have full membership privileges with access to our world class workspace and over $1 million worth of software and equipment for milling, welding, woodworking, electronics and much more. Veterans can use TechShop's cutting edge training and equipment to become more competitive in the job market or pursue their own entrepreneurial goals. Our diverse training offerings provide Veterans with multiples areas of focus to chose from. Our wonderful staff and instructors are also available to provide guidance in selecting the advanced manufacturing-related courses that best meet their objectives as they transition into civilian life and careers. It's our way of saying thank you for your service. The Darby Project is a network of networks that synchronizes the efforts of veteran support organizations to lead revolutionary transition services for the elite Army Rangers! The GI Go Fund has found that veterans often have a difficult time transitioning from the military to civilian life. This is the primary reason that 1/3 or all homeless people in the US once proudly wore the country's uniform. There are currently 200,000 homeless vets in the US. In contrast, 120,000-160,000 soldiers served in Iraq at the height of the surge. The Mission Continues is the only national nonprofit challenging post-9/11 veterans to rebuild a sense of purpose through community service. Many veterans struggle to find purpose at home without the structure, mission and camaraderie of a military unit. The Mission Continues does not offer charity; rather, we challenge returning service members to utilize their tremendous skills and leadership to continue serving our country at home. Through service, veterans find renewed strength and purpose while building stronger communities. Our mission is fueled by a deep belief that our veterans are assets whose leadership is needed now more than ever here at home. The Mission Continues awards community service fellowships to post-9/11 veterans, empowering them to transform their own lives by serving others and directly impact their communities. Mission Continues Fellows serve for six months at a local nonprofit organization addressing key educational, environmental or social issues. Each Fellow works to achieve one of three outcomes at the conclusion of the fellowship: full-time employment, pursuit of higher education or a permanent role of service. The Raider Project connects MARSOC/USMC combat veterans with other veterans to help them transition smoothly, peacefully, successfully into the private sector. The Toolkit for Veteran Friendly Institutions was created by the American Council on Education (ACE). This online resource is designed to help institutions of higher education build effective programs for veteran students and share information. It highlights a variety of best practices and includes video clips, profiles of student veterans programs across the U.S., and a searchable database of tools and resources. Transitioning Veteran is dedicated to helping veterans who have or are in the process of separating from the military and who are looking for information on veteran benefits. Transitioning Veteran is a website that helps guide veterans directly to what I feel are very useful links, when searching for information on education, work and medical benefits. My hope with Transitioning Veteran is to make it easier for a veteran of the Armed Forces to find important information pertaining to veteran benefits. I have spent numerous amounts of time searching the internet for information that would help me to transition back into the civilian world once I had separated from the Air Force. Since being out of the Air Force, I have used this information that I found on the internet, to help me use my GI Bill, find a job and help me when applying for my VA medical benefits. The United Association of Plumbers, Pipefitters and Sprinklerfitters (UA) has partnered with the U.S. military to create the UA Veterans In Piping (VIP) Program, which provides returning vets with 16 weeks of accelerated welding training. But before that career training begins, they kick off the program with an additional two weeks of transitional training to help returning veterans to adjust to civilian life – a process that can be especially difficult for those who joined the military right after high school. The training is free to veterans who are placed in construction careers nationwide, helping to replenish an aging workforce while rebuilding America’s infrastructure. Welders are in high demand nationwide, making job opportunities plentiful for welders who are well-trained and highly-skilled after their intensive training program. With nearly 200 veterans already trained through VIP programs in Washington and California, the next site will be at Camp Williams, Wisconsin. Many more veterans are in need of the career opportunities available through the UA VIP Program. The UA and the U.S. Military can provide a positive re-entry into civilian life, and long-term, lucrative careers for those who have served their country with bravery and honor. With easy-to-use tools, information and community resources, we're here to help you make the transition from military to civilian life. Being a farmer means you’ll get the opportunity to be an entrepreneur, equipment repair specialist, soil scientist, and land steward all rolled into one. Use the resources here to get connected to training opportunities, program and career resources, and read stories like yours on the USDA Blog. The Education and Employment Initiative (E2I) is a Department of Defense (DoD) program that assists wounded, ill and injured Service members early in their recovery process to identify their skills and match them with the education and career opportunities that will help them successfully transition to civilian life. The Office of Veterans Business Development's mission is to maximize the availability, applicability and usability of all administration small business programs for Veterans, Service-Disabled Veterans, Reserve Component Members, and their Dependents or Survivors. USTechVets.org is a U.S. technology industry career portal created to connect veterans, including transitioning military personnel and their family members, with meaningful jobs in America's technology industry. USTechVets.org is a collaborative effort of the Consumer Electronics Association (CEA), Northern Virginia Technology Council (NVTC), Monster.com and Military.com focused on reducing veteran unemployment and giving technology industry companies access to American’s veteran workforce. Our mission is the successful transition of military veterans and their families through the provision of housing, counseling, career development and comprehensive support. Information from the VA about reimbursement for licensing and certification tests. Since 2009, Veteran Artist Program has worked with national veteran and arts organizations to produce six music/theatrical live events, filmed three documentaries, one feature film, curated gallery exhibits, provided videography/photography services, and helped organize more than 30 community improvement projects, including painting two murals in Baltimore. VAP has conducted projects in New York City, San Francisco, Baltimore, Washington D.C., Chicago, Orlando and San Diego. Projects include the Arts, Military + Healing Initiative in D.C., the opening of Bloomberg’sWorkforce1 Veteran Career Center in New York, the first-ever all veteran artist exhibit at the Pentagon and the Arts and Service Celebration in New York City. VAP’s work has been seen on CNN, Fox News, ABC, BBC, MSNBC and covered by NPR, Baltimore Sun, The Washington Post, and The New York Times. VAP, a 501c3 nonprofit, takes artists who are also veterans, and propels their works and careers into the mainstream creative arts community through networking, mentorships, collaborations with professional artists, and original productions. We are based in New York City but are currently creating programming across the country to expand the network and visibility of veteran artists. VAP focuses on five disciplines: Visual Arts, Performing Arts, Writing/Literature, Film/Video, and New/Interactive Media. We also provide high quality, veteran-led, professional services such as event and film production, documentation through video and photography, gallery exhibitions and much more. You’ll find information about starting a business, franchising opportunities, accessing capital, employment opportunities, and more! Our mission is to help facilitate collaborations between veteran-owned small businesses, providing a gateway for entrepreneurs to access resources, programs, funding, and more. The mission of the Veterans Curation Program (VCP) is to provide veterans with job training through the rehabilitation and preservation of archaeological collections owned or administered by the U.S. Army Corps of Engineers (Corps) and which are considered to be part of our Nation’s patrimony. Most of these collections were excavated during the construction of reservoirs and other associated water control programs from 1947 to 1985. The goal of the VCP is to provide vocational training and temporary employment to disabled veterans, while simultaneously providing the Corps a viable means of rehabilitating a portion of its archaeological collections up to federal standards. Veterans in Film and Television is a networking organization that unites current and former members of the military working in the film and television industry. At Veteran's Job Exchange, we are committed to finding the perfect match between dedicated workers and employers looking to build a strong workforce. Our experienced team is also happy to provide resume and career advice to guide workers through their search for the perfect job. Our mission is to provide American veterans of the Iraq and Afghanistan conflicts with pride, education and fulfillment through a permanent source of sustainable income, community and contribution: The family farm. Funded by the King County Veterans and Human Services Levy, the purpose of the Veterans Training Support Center is to provide continuing educational opportunities and professional development to those who provide direct service to veterans and their family members. The aim is to raise awareness and understanding on issues specific to veterans such as invisible wounds like Post Traumatic Stress Disorder and Traumatic Brain Injury, and to encourage agency and institution staff to establish promising best practices that will empower this population in their reintegration and pursuit of personal, academic, and meaningful career goals. The Department of Transportation (DOT) is partnering with the Department of Veterans Affairs (VA) to help military personnel and veterans transition from military training and job specialty skills acquired in the service to exciting careers in the transportation industry. The information below highlights just a few of the exciting careers in the transportation industry which are most common in the military community. Veteran Ventures is a comprehensive entrepreneurial education and mentoring community organization for veterans of all walks of life. We provide veterans with the resources to develop and grow in the business sector, provide business support and assistance with handling personal struggles. We believe as a community we can make a difference in a veteran’s life. Veterati is a digital platform for veterans & military spouses to access mentorship-on-demand from successful professionals across the nation. IFA’s VetFran strategic initiative, founded in 1991, includes over 530 IFA franchisor member companies offering financial incentives, training and mentoring to veterans interested in small business ownership and/or a career path in franchising. VetJobs is available to assist ALL members of "The United States Military Family". This includes Officer and Enlisted, Active Duty, Transitioning Military, Reservists, Veterans, Retirees, of the Air Force, Army, Coast Guard, Marine Corps, Merchant Marine, National Guard, Navy, NOAA and Public Health Service along with Trailing Spouses, Eligible Former Spouses, Widows, Widowers and Dependents and DOD civilians. The Vetted Foundation provides veterans with executive education, career services, and follow-on placement in industry. The Vetted Foundation is the optimal veteran transition platform to transform proven military leaders into tomorrow's industry leaders. Vetted identifies military talent for transition preparation and planning, Texas-based executive education, and industry placement in the private sector. The Vetted Foundation is creating the first State Model, the Texas Model, to serve as the launch pad for successful veteran transitions. The Virtual Lifetime Electronic Record (VLER) enables the Department of Veterans Affairs (VA) and its partners to proactively provide the full continuum of services and benefits to veterans through veteran-centric processes made possible by effective, efficient, and secure standards-based information sharing. VLER is a multi-faceted business and technology initiative that includes a portfolio of health, benefits, personnel, and administrative information sharing capabilities. It provides veterans, service members, their families, care-givers, and service providers with a single source of information for health and benefits needs in a way that is secure and authorized by the veteran or service member. The Volt Military Heroes Program is designed to provide returning American military service veterans with access to exceptional employment opportunities at some of America’s top corporations. The skills, experience, determination and motivation demonstrated by American service veterans are second to none and represent a natural match for American companies wishing to maintain their competitive edge in global markets. For veterans returning to civilian life, this program offers a seamless transition back into American businesses. Organizations seeking the most talented, disciplined and productive professional resources will not find a better source for excellence than veteran U.S. servicemen and women. V-WISE is committed to women veterans by providing them the tools to become successful entrepreneurs. Our goal is to integrate their leadership, integrity, focus and drive into a premier educational training program taught by accomplished entrepreneurs and entrepreneurship educators from across the United States. V-WISE enables women veterans to find their passion and to learn the business-savvy skills to turn their ideas or businesses into a growth ventures. V-WISE recognizes entrepreneurship an important part of economic growth across the country and this program is the key for women Veterans to truly pursue their dreams and to make them a reality. Warrior Gateway is a non-profit whose mission is to connect individuals in the military, veterans, and their families with federal, state, and local government programs as well as non-profit organizations in their local communities. Warrior Gateway’s efforts were recognized in 2011 with the Federal Computer Week Fed-100 award for significant contributions to the Federal IT community. The Warrior to Cyber Warrior™ (W2CW) program is a not-for-profit entity. This program provides veterans with training, certification and a career path in the field of cyber security, a growing industry. Webucator offers military veterans and their families free access to all of their online self-paced courses. The courses range from Microsoft Office to customer service, and web design and coding. When veterans and their family members input the coupon code "VETERANS" at checkout, it will deduct the entire price of the course. The coupon never expires! Welcome Home Resumes develops a unique Interactive Multimedia Resumes for Veterans FREE of charge - to help them stand out. Through extensive research with thousands of HR Departments across the country, we have developed a TOOL that will revolutionize the way military job seekers promote themselves as they search for that new position. The IMR provides the elements that HR Departments are looking for, in an easy to view, consolidated structure. By using the IMR you will find that you will get more job interviews with people who have already formed a favorable first impression of you. That, in itself, gives you, the applicant, a distinct advantage over all the rest who have a traditional paper resume. WeWork has teamed up with Patriot Boot Camp to support veteran creators, providing workspace and incubator communities in Denver, Austin, and additional cities soon. Work Vessels for Veterans (WVFV) is an all-volunteer movement assisting returning veterans to begin their civilian careers or educational pursuits by acquiring and distributing the necessary start-up tools. Founded with the gift of a fishing boat that began a commercial fishing career for a returning Iraq veteran, the foundation is expanding its outreach to other industries to assist our returning military. Our mission is large scale economic development to create jobs, both working with industry and doing it ourself, that are for our fellow countrymen and women who volunteered to serve this great country. We are the intersection of military meets entrepreneurial meets economic development. We provide Mentor-Protege support to our fellow veterans. ZipRecruiter is a free job search website with an emphasis on helping people find meaningful jobs. In 2018, ZipRecruiter launched a page for veterans seeking employment. ZipRecruiter has become the fastest growing job board. It is free for veterans to use to find jobs or internships, as it connects them to thousands of job listings all over the country. ZipCares partners with companies to support veterans as they transition into civilian careers. We know veterans make great employees, and we’re proud to help our heroes and their families. The Institute for Veterans and Military Families (IVMF) is the first interdisciplinary national institute in higher education focused on the social, economic, education and policy issues impacting veterans and their families post-service. Through our focus on veteran-facing programming, research and policy, employment and employer support, and community engagement, the institute provides in-depth analysis of the challenges facing the veteran community, captures best practices and serves as a forum to facilitate new partnerships and strong relationships between the individuals and organizations committed to making a difference for veterans and military families. The Value Of a Veteran is a woman-owned, veteran-owned consulting service that specializes in educating HR and diversity professionals on the best practices for finding, recruiting, and retaining military service members and veterans with disabilities. We teach organizations HOW to recruit and retain. Military veterans, Guard/Reserve and military spouses training and consulting available for corporate, government, higher education, and franchise organizations.